Attack of the Killer Donuts seems to have taken its inspiration from the 90% of Attack of the Killer Tomatoes that didn't work and ignored the 10% that did. Maybe tomatoes are funnier than donuts? That thought may cross the minds of bad-movie fans who sit through Attack of the Killer Donuts hoping to discover a camp classic. The title of the 2016 production (which opened in Los Angeles this week) announces clearly enough that the intent is to emulate John DeBello's Attack of the Killer Tomatoes (1978), which earned a minor cult reputation for deliberately embracing its own badness for the sake of cheap laughs. Unfortunately, Attack of the Killer Donuts delivers the low quality but not the laughter. The reason is easy enough to pinpoint: the best bits in Attack of the Killer Tomatoes were brief cutaways to random victims, little one-joke scenes that ended before outwearing their welcome; Attack of the Killer Donuts stays relentless focused on its main characters, and no joke is delivered quickly - every routine, however unfunny, is milked endlessly. It's almost as if the new film took its inspiration from the 90% of Attack of the Killer Tomatoes that didn't work and ignored the 10% that did. The human story follows Johnny Wentworth (Justin Ray), who thinks he is in a relationship with a beautiful blond who is clearly using him for money so she can spend time with her real boyfriend. Not only does this make Johnny look like a hopeless loser; it also makes it impossible to understand why Michelle (Kayla Compton), Johnny's co-worker at Dandy Donuts, is interested in someone so stupid. Eventually, the film remembers it's supposed to be about killer donuts. Fortunately for an audience weary of the characters' unamusing antics, Johnny's Uncle Luther (Michael Swan) comes to Dandy Donuts to retrieve a laptop (which for some reason he calls a tablet) - not because he particularly needs it but because the film needs him to get into a fight with the owner so that Luther (whose been experimenting with dead rats in the basement) can spill his latest invention into the donut batter: a green reanimation fluid that looks as if borrowed from Herbert West. At last! 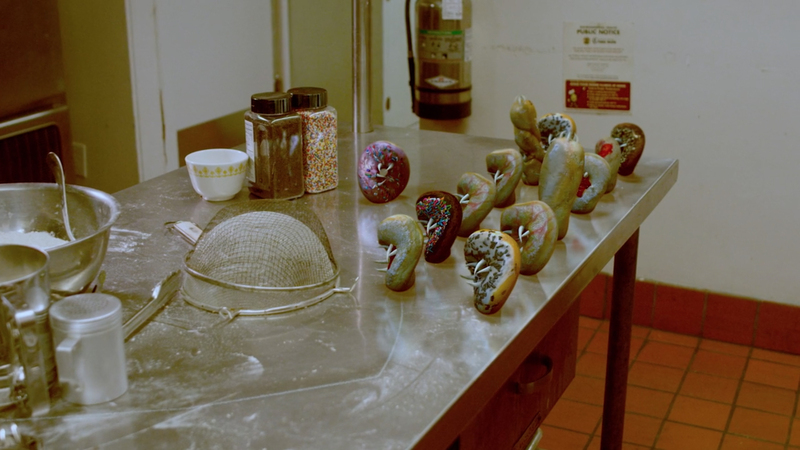 Now our killer donuts are finally on the way - after a suitable gestation period, of course. Unfortunately, like everything else in the movie, the donut attack scenes do go on a bit, sometimes with an unfunny building up, sometimes with an excess emphasis on the explosive flatulence and diarrhea that afflict those unfortunate to take a bit of the tainted treats. The little toothy circles of doughy death are amusingly rendered in CGI when bouncing in pursuit of their victims. In close up the computer origins are a bit more obvious; the practical effects look somewhat better. The funniest bits come when real donuts are obviously being flung at the actors by off-screen crew members. Thanks to improved technology, bad movies today look much better than they once did; grainy photography and sloppy editing are almost things of the past. That may not be an advantage when spoofing the tropes of cheesy exploitation films. Attack of the Killer Donuts looks slick enough, but the scenes being shot and cut together are desperately in need of something more than competent presentation. Cutting in for a well-lit close up does more harm than good when the punchline being delivered is execrable; covering a scene from multiple angles is a major mistake when the action and dialogue being emphasized are trivial filler that should be dashed off as quickly as possible. Nothing in Attack of the Killer Donuts warrants the attention lavished on it. Still less does it warrant the attention of the audience, who may feel as if they are being dared to get fed up and walk out. Viewers sifting through the film's tainted batter for a few tasty nuggets will enjoy the energetic, rock-infused score by Joel Someillan, including a wacky title song with lyrics by Nick Olas, performed by the Sun Ghosts - the one element of Attack of the Killer Donuts that truly exceeds its progenitor. Attack of the Killer Donuts is currently playing at Laemmle's Royal Theatre in West Los Angeles. The killer donuts take second stage to the unfunny comedy routines of the human characters, which run on so long it’s as if the film is daring its audience to get fed up and walk out. ATTACK OF THE KILLER TOMATOES (2016, released November 11, 2017): Directed by Scott Wheeler. Written by Nathan Dalton, Christ De Christopher, Rafael Diaz-Wagner. 98 mins. With: Justin Ray, Kssandra Voyagis, Michael Swan, Kayla Compton, Frederick Burns, C. Thomas Howell.